Sanitation Control Systems clean and disinfect irrigation systems, grow media, and greenhouse and nursery surfaces! This in turn results in better plant health, lower labor costs, and improved profitability from higher yields. Our agricultural, greenhouse, and nursery customers who have implemented Hanna Sanitation Control Systems were able to kill pathogens such as pythium, a common bacteria, as well as algae and iron-forming bacteria that clog filters and nozzles. Unfortunately, sanitation control systems are typically thought of as expensive to purchase and maintain. As a result, many greenhouses and nurseries still use manual sanitation processes. Thankfully, Hanna's Sanitation Control System, utilizing chlorine, changes the cost equation. We can implement a safe and effective system for less than $10,000, with annual chlorine costs as low as $100. Chlorine is a powerful oxidizer. When added to water it steals electrons from other substances, altering the chemical makeup of unwanted organisms and combining with dangerous inorganic compounds to render them harmless. Pathogens are easy to find on root substrates, containers, under benches, and on the floor. They can be introduced to plugs or transplants and can make their way into a facility on shoes or other materials brought in by guests. Irrigation water is quite often overlooked as a source of infection. Water sources considered clean, such as municipal supplies, may carry dangerous pathogens and should be tested. Other sources such as surface water, irrigation wells, and especially re-circulated feed water pose a substantial threat. If an effective sanitizer, that is controlled and injected properly is not regularly used, crops (i.e. Geraniums, Perennials, Bedding Plants, etc.) can suffer significant infection and other detrimental conditions such as Root Rots, Mildews, Chrysanthemum White Rust, Viruses, Foliar Diseases, and more. This can devastate an entire year’s crop costing substantial investment. Chlorine is a powerful tool when used as part of a sound Sanitation plan. Chlorine is typically introduced to water in the form of hypochlorites (tablets, solutions, or powder) and gas. Chlorine (Cl 2 ) combines with water to form “free chlorine” (hypochlorous acid) which is a powerful bactericide/sanitizer. OCl - (Hypochlorite ion) is the slow acting form of free chlorine. OCl - is 80 to 300 times less effective than HOCl. Note: The concentration of HOCl decreases (OCl- increases) very rapidly with an increase in pH, changing the oxidizing potential of the water. There are solid (calcium hypochlorite), liquid (sodium hypochlorite) and gas forms of chlorine. All three forms deliver hypochlorous acid (HOCl) upon dissolution in water, which is the sanitizing form of chlorine. Below, the focus is on the liquid sodium hypochlorite (i.e., bleach) and solid calcium hypochlorite (i.e., tablets) forms. Chemicals containing chlorine can simply be dosed directly into the irrigation water using volumetric proportion. A specific initial dose (e.g., 5 parts per million) is provided at the well head, to ensure adequate residual (typically 0.5 to 2 ppm) at the outlet. The difference between the initial and residual concentration is termed chlorine demand. The treatment system is most effective if the irrigation water quality (chlorine demand) remains constant. If the pH, biological load, or temperature never varies then the dosing ratio can be determined using a simple chlorine meter. This, however, is unrealistic. Simple dosing is less effective when water has a fluctuating chlorine demand, which applies to a majority of greenhouse watering systems. Use of recycled or pond water. Accumulation of fertilizers, peat, and plant debris in the irrigation water. The mode of action of hypochlorous acid is through oxidation and chlorination of many types of organic material, and not just pathogens or algae. To make the addition of hypochlorous acid more effective for pathogen control, water should be pre-filtered to remove excess organic material. Fluctuating chlorine demand of the water system affects the amount of chlorine that needs to be initially dosed to provide a consistent residual level. Research at the University of Guelph showed that maintaining 2 ppm of free chlorine for five minutes can control most common plant pathogens. However, biological load varies with temperature and tends to increase during spring and summer, especially with surface or recycled water sources. Higher temperatures require more chlorine injection to combat algae and pathogen growth. Seasonal fluctuations in water alkalinity or pH can also change the chlorine demand because the concentration of hypochlorous acid decreases as pH increases. Consistent and simple chlorine dosing without adequate control of residual chlorine concentration can be harmful to plants. If chlorine demand suddenly drops (for example, because of cold weather), then residual chlorine can rise to phytotoxic levels (typically above 4 ppm hypochlorous acid for short term exposure and 2 ppm for long-term exposure). 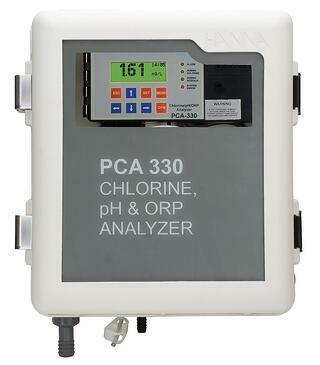 If chlorine demand increases, hypochlorous acid level may be inadequate to control pathogens. Overdosing or release of gas into the air (off-gassing) at very low pH are potential worker safety hazards. The point during the addition of chlorine where the reaction with organic and inorganic materials stops. At this point “Chlorine Demand” is satisfied. The total of all the compounds with disinfecting properties PLUS any remaining uncombined (free) chlorine. Free uncombined chlorine remaining after chlorine demand is met. The amount of chlorine added to meet chlorine demand plus the amount of chlorine needed for further disinfecting. The process of adding chlorine to water until the chlorine demand has been satisfied. Public water supplies usually chlorinate past the breakpoint. Step 1: Adding a small amount of chlorine (first) reacts with (oxidizes) manganese, iron, and nitrite…assuming those elements are present. No other reactions occur. Step 2: Increasing the chlorine dose will facilitate reaction with organics and ammonia; CHLORAMINES AND CHLORORGANICS will form. Step 3: Adding a bit more chlorine destroys the chloramines and some or most of the chlororganics. Breakpoint Chlorination is achieved. Step 4: Adding more chlorine creates a free residual concentration for future disinfecting. Controlled injection and measurement of chlorine concentration can be combined with the measurement of oxidation-reduction potential (ORP). Oxidation-reduction potential is read in millivolts (mV) and measures the oxidative power of the treated water. Basically, the ORP number is a gauge of the sanitizing effectiveness of your water. The higher the value, the more powerful the sanitizing effect. 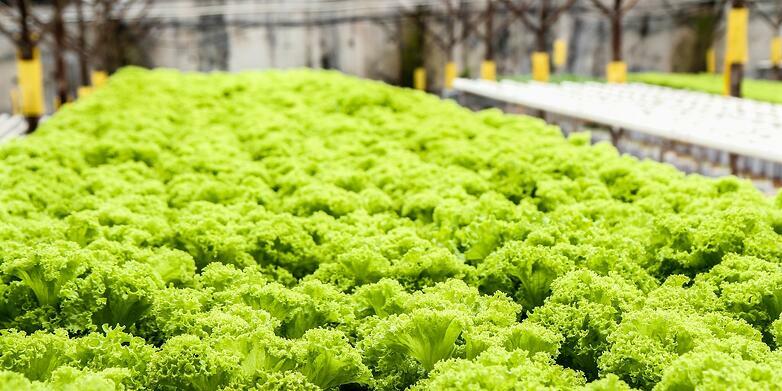 ORP is a proven technology for municipal water treatment and food safety and is becoming more prominent in the greenhouse and agricultural industries. An oxidation-reduction potential level of 650 to 750 millivolts is typically used to indicate adequate sanitation based on killing of human pathogens. 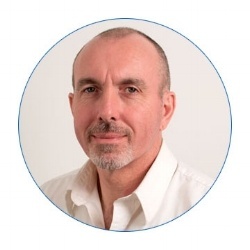 Research is ongoing to refine oxidation-reduction potential levels suited for plant production, but is has been shown that levels as low as 550 have proven effective in destroying many common pathogens destructive to plants. Control using chlorine and oxidation-reduction potential is ideally undertaken with inline sensors and dosage systems. This method of control can be applied to dosage of all chlorine forms (gas, liquid and solid), as well as some other oxidizing chemicals. An additional controller for water pH is also needed where water is acidified. In a low-tech installation without inline controls, water pH and free chlorine can be measured weekly using calibrated handheld meters. 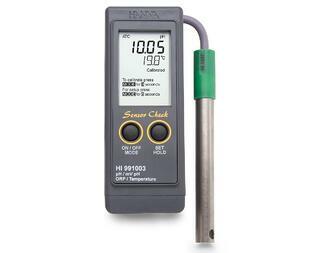 Handheld oxidation-reduction potential meters are also available. At the University of Florida, tests with commercially available chlorine meters including a Hanna oxidation-reduction potential (ORP) meter have yielded results similar to a higher-cost laboratory sensor. a. Chlorine should be combined with other water treatment components such as filtration and aeration to increase efficacy. b. Store liquid sodium hypochlorite protected from ultraviolet light, either at low temperatures (60 F - 70 F) or in smaller volumes so that it is turned over in 15 days or less (degradation rate doubles for each 10 degree (F) temperature increase). c. Store solid calcium hypochlorite in a dry location. d. At the low chlorination rates (below 2 ppm) used for constant treatment, sodium, calcium, or chlorine will not significantly affect plant nutrition, water electrical conductivity, calcium deposits, or pipe corrosion. Note: When handling concentrated chlorine, use injectors and piping designed for caustic chemicals. Chlorine can react with some metals and plastics so check with the manufacturer of your irrigation system components to make sure that problems will not occur. f. Follow guidelines for operator safety and handling. Never mix concentrated chlorine with other chemicals. In many Commercial Greenhouses, Iron Bacteria is a common problem. The bacteria clogs boom irrigation nozzles and various other types of emitters; as a result, plant quality may be severely damaged accompanied by a drastic increase in labor costs. The Hanna Chlorination System was designed, and has been installed in many Greenhouses, to safely and accurately dose sodium hypochlorite (bleach) into a circulating loop built onto the water storage tank or directly into the process stream. The system includes an oxidation- reduction potential (ORP) controller, probes, chlorine injector and a process chlorine analyzer (PCA). Chlorine is injected into the tank via the circulating loop, so the oxidation-reduction potential is maintained at 600 to 650 millivolts (mV). The system is designed so that the return water splashes into the tank. This creates a natural oxidative effect, lessening the amount of Chlorine required. The Hanna system has dual safety controls, including metering the chlorine via oxidation- reduction potential (ORP) and a second control based on chlorine concentration. This redundancy ensures the highest safety and absolute confidence that only the exact amount of Chlorine is delivered. The Hanna chlorination system has repeatedly provided clean irrigation water with reduced algae growth and has eliminated iron bacteria clogging of emitters and harmful pathogens. The initial cost of the Hanna Sanitation System is less the $10K with installation. The typical cost for treating water using the Hanna Sani-System is less than $100 per year for chlorine bleach. Some questions to ask when thinking about return on investment for a Sanitation Control System from Hanna. a. How much of your crop have you lost due to sanitation issues over the last 10 years? b. How much time does it take to maintain your manual sanitation processes? c. Have you had a major event like Iron bacteria clogging that resulted in increased labor costs associated with cleaning boom nozzles and other emitters? c. What is your current sanitation chemical expense? A Hanna Sanitation Control System can be installed for less than $10,000 with an annual expense of less than $100. Note: This low annual cost is a result of the synergistic benefits of aeration, filtration, and accurately controlling the chlorine injection via oxidation-reduction potential (ORP). Do you worry about a major problem as a result of a sanitation issue?